For those that have been fans of Southern Bastards’ Jason Aaron for the last several years, there is one project in particular you wanted to see option. Scalped, his controversial and bloody Vertigo story of a man returning to a reservation as an undercover FBI agent to tackle corruption, is now being brought to network television. WGN has announced that it will be optioning Scalped, with Geoff Johns being attached as an executive producer. This is interesting given that Johns is not only not previously associated with Scalped, but also not really known for these types of comics in general. Warner Horizon Television is handling the show and WGN America has said that it will be looking into using only Native American actors, which pretty much all the characters are. The main issue that comes up with the WGN announcement is whether or not WGN can actually handle a property like this. Fox’s recent attempt at both Lucifer and Constantine were embarrassing misfires to adapt adult and complex properties to a very dumbed down and censored network version. 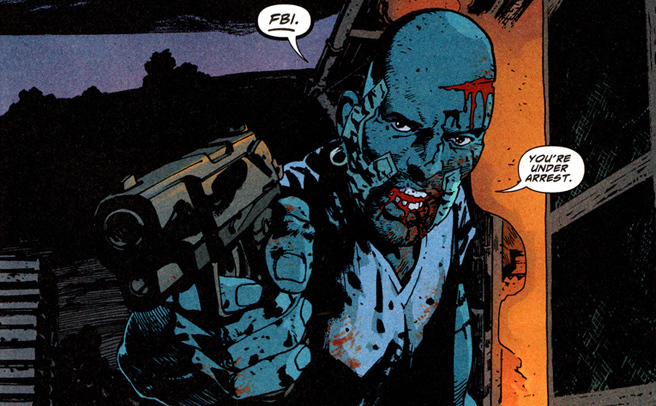 Scalped is much more intense than either of those, likely rivaling comics like Preacher in terms of content, so the real question is how any channel other than something like Netflix, HBO, or Showtime would be able to actually take this on. We have yet to see a network do this type of property well, the closest being AMC and their Walking Dead success. We will really need to wait and see once there is more in place, but it can only be a good thing overall that Vertigo properties are getting such a spotlight.